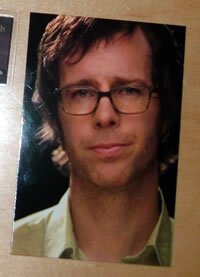 theSuburbs.org.uk - the original Ben Folds website - New Ben Folds Fan Club Stuff! New Ben Folds Fan Club Stuff! Are you one of the 57% of people who renewed their fanclub membership? I am (well, I have to let you guys know what's happening, don't I? ), and yesterday I got my renewal pack through the post. So what are the 'exclusive gifts' this time around? Let's see here. In my brown envelope I got: four postcards, and renewed membership card and... a letter welcoming me back. I've posted an image over on the 'Will you renew?' thread. The letter promises more pre-sales and 'exclusive gifts chosen by Ben' (that old line? We've already established that this nothing to do with the guy himself!) before the year is up. Incidentally, the customs sticker listed the contents value at $20. Make my other $15 count, fellas. Eerily, when I shoved my hand into the the brown envelope and pulled out the contents, the first things I saw was the postcard pictured. Expression wise, it was like looking into a mirror. Even in postcard form, he feels your pain. In other news; more tour dates keep popping up. I'm adding them to the tour page as soon as they appear, as well as doing a LOT of work behind-the-scenes. If you're signed up to the message boards, you can mark yourself as attending a show and see which other fellow 'burbians will be there. Why not send them a message and meet up? Just click their name on the tour page and hit "Send this person a personal message". Very soon members will also be able to do much more, so if you're not already a part of the family, come get some!